Big Hatchet Peak looms south of town. 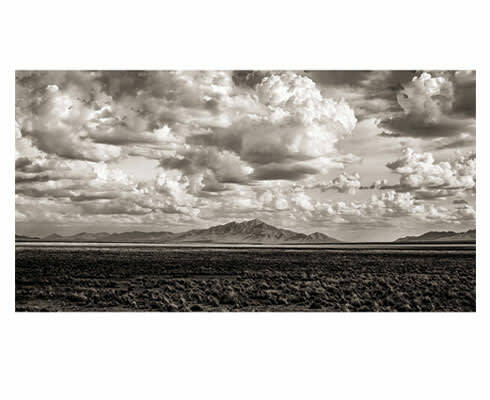 TO APPRECIATE HACHITA, a small town of about 30 people at the entrance to the bootheel of southwestern New Mexico, you must first appreciate the landscape that surrounds it. The two are entwined, one dependent on the other, like the towering yuccas that populate this land and the delicate yucca moths that pollinate them. Here is New Mexico in all its subtle beauty. Olive-green mesquite bushes, yucca blossoms the color of white smoke, brushy broomweed plants, and the occasional wildflower—all leaning slightly sideways from the steady nudge of the westerly wind, scattered across a valley whose reach is only halted by the Mexican border. To the south rise the Big Hatchet Mountains, crooked and imposing; to the west, the Little Hatchet, from which the town of Hachita derived its name. Silver City is an hour-and-a-half drive north toward the Black Range and the Gila National Forest; it’s about 50 miles southwest of Deming. And above it all, a canopy of endless blue, where thin, milky wisps of clouds drift past like pleasant memories. It’s a landscape that reveals itself gradually. The same is true of Hachita and the people who live here. The streets of Hachita are unpaved. Residents drive their pickup trucks slowly so as not to stir up dust—the modern descendant of a tradition in the West to ride horses slowly past a campsite. Going slowly also gives you time to avoid the jackrabbits and quail as they scurry across the road. There’s really no reason to hurry here. I try to slow down during my visit to Hachita. I let lulls in conversations linger. I visit with people at their preferred time of “I’ll come find you later.” I try not to kick up dust. And I find that by not hurrying, I’m free to savor the moments without worrying about the hours. I visit one evening with Cal West in a corner lot filled with sheds and coops. Cal comes here once a day to tend to his Bantam chickens, gathering their eggs, dispensing feed from an old coffee can, freshening their water. Fearing that a chick might fall into the water bowl, Cal has placed rocks inside it to create small islands. You wouldn’t know it from the tenderness he shows in these duties, but Cal was once a professional wrestler. A heel, no less—the bad guys of the squared circle, ignoring the ref and badgering the audience. Promoters called him “Cowboy Cal West” and said he was from Arizona, a ring name and backstory that surprised this Massachusetts-born lad the first time he heard it. Cal has a photo of himself in those days on his bedroom wall: black trunks, fists in the air, ready to go all Sturm und Drang on some hapless opponent. With chickens clucking in the background, Cal demonstrates the move that opened the match he had in Connecticut in 1963 against legendary World Wide Wrestling Federation heavyweight champion Bruno Sammartino. One hand behind his opponent’s neck and the other on his shoulder, Cal squared off against Bruno. Then some grappling. Or, as Cal recalls, attempted grappling. These days, and several decades of other careers later—including a stint as a milkman—Cal uses his hands not to punch but to strum. He attends bluegrass festivals in New Mexico and West Texas, where he performs songs he’s written on his Martin guitar. I’m so glad to be out here. Glad to be out here. I hear that sentiment expressed often during my visit. Hachita might be 30 miles from the nearest gas pump, but you get privacy, you get peacefulness, and you get to watch storms as they approach the town from across the valley. The people who live here are here by choice. Although sometimes, it seems, Hachita chooses them. Doing union sheet-metal work in Alaska, Steven Zerbach began to see images of pomegranates everywhere in his life—in doctors’ office magazines, religious paintings, advertisements. He was unsure what to make of it, although he was certain there was a higher force involved. Indeed, he thinks of pomegranates as “the holiest of holy fruits,” in part because of their power to resurrect themselves after a freeze that will kill other plants. With his wife, Molly, he started doing research, eating pomegranates and drinking their juice, and after moving to Alamogordo, began searching from Arizona to Texas for a place to grow them. Rolling into Hachita one day in 2009, he stopped to visit with the postmaster, who told him of a house for sale a block away. And there, in the yard: a pomegranate tree. Steven and Molly are looking forward to their first full harvest later this year. Eventually, they hope to open their orchard to pick-it-yourself customers, and perhaps even host a pomegranate festival right here in Hachita. As Steven and I chat outside a side gate, a dust devil comes down the street, mad at everything. When it reaches a cross street, it splits in two and races down both streets at once. And something Steven told me earlier comes back to mind. There are more houses in Hachita today than people, and to understand why requires understanding the origins of Hachita, which in turn requires a trip out to the Little Hatchet Mountains. Scattered among the low foothills are the sun-baked ruins of an old mining town. This was the first location to be called Hachita, sometime in the 1870s as part of the Eureka mining district. Miners here dropped into the earth and returned with silver, copper, and turquoise. An old headframe still stands, as do the walls of hardscrabble buildings, including a main house, a dance hall, and two powder magazines, double-walled to force an explosion to blow upward out the roof. All around me, I see ghosts. There is something about this old place, something always on the periphery, as if the past and the present are separated by only a lack of attention. The crumbling adobe walls, the roadrunner nest in the sagging cupola of the old blacksmith shop, the broken window frames—in them lives the DNA of the past, offering enough sensory cues to mentally reanimate the town. Yuccas become prospectors with work-worn faces and callused hands. The sound of buzzing cicadas is the murmuring of miners as they scurry around underneath the earth. When the railroad arrived in the valley around 1901, bringing the possibilities of new economies, residents of Hachita built houses closer to the rails. This became “New Hachita,” while the mining camp was referred to as “Old Hachita.” As mining profits declined over the subsequent years, only the hardiest souls remained in the mountains—one old-timer lived here until the 1970s. Proximity to the railroad and shipping pens made Hachita an important headquarters for area ranches. Those ranches are still around: the Hatchet Ranch, the Hurt Ranch, the Diamond A.
Lawrence Hurt is one of the owners of Hurt Cattle Company. He invites me to view a roundup, something I’ve not seen before. I arrive early that morning at a corral on his ranch; I know I’m in the right place when I see the pickup trucks, their windshields reflecting the spinning fan of the Aermotor windmill by the water tank. As the morning sun lifts itself over the Big Hatchet Mountains and the last vestiges of the night disappear in a red glow on the western horizon, Lawrence and the other men ride off on their horses into the rugged, raging beauty of the desert at dawn. In the distance, I watch as a blue and white object maneuvers back and forth in the sky, gliding, then angling right, then left again: a Robinson R22 Beta II helicopter. Hank Hays is at the controls. Hank has been working at the Hurt Ranch for 16 years now as, in the words of his tongue-in-cheek business card, a “Bovine Pursuit Specialist.” Hank previously flew helicopters in the US Border Patrol and cowboyed in his youth, so he came into this job familiar with both the terrain and the duties. During spring and fall roundups, he herds cattle from above—careful not to separate the calves from their mothers—letting them move safely to the corral. The helicopter saves time and money. What once took two dozen men three days can now be done by only a few in a matter of hours. A dust trail rises in the west, and black and brown forms emerge from the mesquite bushes as the helicopter makes long sweeps behind them. The men ride alongside the herd, occasionally slapping their thighs to maintain order. Soon there is a soundtrack to go with the scene: the thud of hoofs on the hard dirt, the gallop of horses, the bellows as the cows reach the pen and are moved inside. A nearby bird chooses that moment to express his happiness in song, as if welcoming the new arrivals. As for welcoming human newcomers in Hachita, that job often fell to the longtime postmaster, Vera Mora. When Cal West bought a post-office box back in 1998, Vera responded with a handwritten message welcoming him to town. It was she who told Steven Zerbach to go see the house for sale, the very one where his pomegranate orchard now grows. At the postal counter for more than 20 years, Vera was Hachita’s connection to the outside world. It pained her to stamp a letter “undeliverable”—she’d go out of her way to track people down and deliver their mail, even people who had left town years before. Though she’s retired now, Vera remains legendary. You can mention her name in Columbus, 40 miles away, and people know her. Longtime area resident Wade White had a nickname for her: a rose in the desert. The only business still open today, the post office is the most active place in town. The second-most is probably the community center, housed in the old Hachita Mercantile building. Longtime residents Marilyn West, Cal’s wife, and her daughter, Judy Keeler, meet me there one morning to show me the grand old place. Their voices echoing in the vast main room, Marilyn and Judy recall the mercantile layout: the former post office in the corner, groceries beside that, meat at the back, then clothes and farm equipment on the other side. Judy remembers breaking a plate here as a child; Marilyn felt obliged to buy the set. In addition to running one of the family’s ranches, Judy is the secretary of the Hachita Community Center Association, which has bought the mercantile building and hopes to use it to rejuvenate community functions. One of their fund-raising efforts includes painting the names of current and former Hachita residents on the wall. The wall reads like a biography of Hachita, hand-lettered in blue paint. Old family names like Weatherford, Everhart, Smith, and Been are here. Marilyn and Judy’s family is represented by the “Faulkner Ranch” tile. Marilyn came to Hachita in 1948; in fact, she preceded Vera as the Hachita postmaster. Judy’s great-grandfather, who was among the first prospectors out at Old Hachita, carried his dynamite in an old inner tube. Another name on that wall is Raymond Cobos. Raised in Hachita, Raymond recently retired as the sheriff of Luna County. Raymond thought he was the first person from Hachita to become sheriff of Luna County, but it turns out there was another one before him many years ago. This doesn’t disappoint him; it makes him proud. I get to visit with Raymond one day. We drive around Hachita in his pickup as he points out the old diner and gas station, along with a saloon, both now closed. The cement building with the fallen roof used to be Pearl’s Café, which advertised “homemade pies” in the school yearbook—Raymond would watch through the window as Pearl Jacobs baked those pies and then savor their aroma as they cooled outside. Stomping through the desert behind where his childhood home once stood, Raymond tells me how he pulled his wagon around town and collected used cans, which became soldiers in play battle reenactments. Hamm’s beer cans were blue, so they were Union troops. Silver-gray Coors cans became Confederates. Mason jar lids were helmets. Rocks were bullets. And sure enough, among the mesquite bushes, we come upon those cans all these years later, rusted, crushed by animals, but still on the battlefield where they fell: Union soldiers on one side and Coors on the other. Hachita preserves the remnants of a young boy’s imagination just as lovingly as it does its own adobe origins out there in the mountains. In Hachita, folks mourn the loss of times gone by—a pain felt no less deeply for the fewer people around to share it. Former residents converge on the town every two years for the Hachita Good Times Reunion, coming together, telling stories, recalling names and places, all in an attempt to never say goodbye. The reunions are well attended. Something about Hachita draws people back. I bet it’s the evenings. I grew to appreciate those special hours in particular here, when the heat of the day would break and the earth and sky would blend as darkness erased their boundaries. I imagined everyone in Hachita looking west at the same time every evening, out toward where those old shacks still stood, as the orange glow of the setting sun turned the mountains to blue silhouettes. Dusk would gather an ensemble of musicians and set them each to playing from a different score, a cacophony I called the Hachita Vespers. Doves cooed from the rafters of abandoned buildings, dogs barked at jackrabbits, a car engine turned over two or three times before finally catching, a flock of sparrows abandoned a tree branch in a sudden thunderous fluttering of wings. Then, after night settled and the full moon shone a spotlight on the town, coyotes loosed their lonely howls somewhere out in a darkness I respected too much to enter. But as pleasant as I found the vespers, they were incomplete. Ruthie Chadborn, who grew up in Hachita and now lives down the road in the even smaller town of Windmill, remembers ringing the bell at the old elementary school, now closed. One of the bigger kids would pull the rope, and she and the rest of the little kids would jump on and tug with all the passion they could muster. The bell rang at the start of classes and the end of recess, pealing joyfully out over the town several times a day. Gone as well is the whistle of the steam engines as they came through town. The line that started it all was removed in the early 1960s. Ruthie’s husband, Gene, who she met at Pearl’s Café, remembers the tracks being removed—he was part of the effort. Working westward, crews took up three or four miles of rail a day, tossing the spikes and couplings into a barrel and lifting the rails by crane onto the back of the truck Gene was driving. Residents of Hachita watched as the rails were taken away, feeling, as Raymond Cobos remembers, a mixture of resentment and helplessness. The mercantile closed shortly thereafter, and the school followed. Families left. With some rise and fall in the years since, the town eventually settled into the gentle, unassuming stature it maintains today. And yet, despite the quiet days here, people from around the world visit Hachita every year, especially between April and May. The train has been replaced by a trail: the Continental Divide National Scenic Trail, commonly called the CDT. Hachita is the first town encountered by eager hikers and cyclists starting their 3,100-mile trek north, known as “northbounders,” and the last by exhausted southbounders hiking the opposite direction. That makes Hachita a natural welcome center, and plans are moving forward to turn the community center into a place where hikers can relax aJnd recharge. Jeffery Sharp is the Southern Terminus coordinator for the CDT. He transports hikers to and from the point where northbounders officially start their hike—way, way, way out in the desert south of Hachita. Jeffery agrees to take me out to see the terminus, but that offer comes with stipulations. I’m to bring a sweatshirt and water, he tells me, and I’m asked a couple times about the health of my back. I soon understand why. In his 1988 Scout II International, Jeffery and I jostle over road ruts, navigate arroyos, and bounce across a stretch of jagged rocks he calls “tire-cutter alley.” Jeffery is a jovial guy; he laughs easily and often, banging his hand on the dashboard as he does. We ascend a rise that opens onto a magnificent ocotillo forest, made all the more beautiful by the knowledge that so few people will ever see it. Still, warning signs are everywhere. At one point we pass an oil slick in the middle of the road, and here and there we see bits of tire rubber, each a part of a larger, probably unhappy story—one that no doubt ends abruptly. As does ours. About eight miles out from the site, the jeep sags at the back right. We have a flat. We didn’t fight the desert; we tried to work with it. But the desert can be a fickle judge, and today the verdict is no. Flat swapped with spare, feeling disappointed, we turn back. But not to home—not yet. Jeffery wants me to meet Lynora Harris first. Along with Jeffery, Fire Chief Tom Nelson, and a handful of others in town, Lynora is a member of the Hachita Volunteer Fire Department. From her home, Lynora works as a dispatch center, summoning volunteers when a call goes out and relaying messages while they’re in the field. When the firefighters return, she cooks meals for them. They call her Mom, and they gather in her house to socialize several times a week. As we sit in Lynora’s living room, Jeffery eagerly relates the travails of our afternoon adventure, while Lynora listens intently and makes exclamations at all the exciting turning points in the tale. I find myself getting into the retelling, offering details about the trip, such as the oil slick. I’m no longer disappointed we didn’t make it. Getting a flat makes for a good story, and a good story in Hachita is worth its weight in turquoise from those old mines. I even add a bit of pathos by hinting at the torment we would have endured if we’d had to walk back. In that desert, in that heat—can you imagine? I know I should probably go. Night is coming on, and I’m tired and dirty. But a cool breeze drifts in through the screen door, the biscuits in the oven smell like honeysuckle, and the company is top rate. I want to savor the moment.